Children love these classic Ride-On Toys and will spend hours entertaining themselves with these wheelie fun-machines. Whether it’s a ride-on pedal tractor or a ride-on suitcase, that sense of driving a vehicle is something we all aspired to from a very young age. There are so many different designs and concepts out there now that you can use these reviews to help you choose the right one. It’s great how the classics endure but there are also some new kids on the block. Funky designs and modern ride-on's are available along with the toys that we are more familar with. One of the best things about the classic ride-on toys is that they can be bought once and then passed along to younger siblings. In fact, I know some teenagers who find it very hard to give up on their favorite ride-on toy and refuse to give them away to a younger child. Create some lasting memories for your child with a popular ride-on toy. Use these reviews and guides to help you choose the best ones for your child. As you would expect from Little Tikes, they have come up with quite brilliant and innovative 3 stage ride-on. 3 stages from babies being pushed by mum or dad to the little ones riding on their own. This quite brilliant little ride-on grows with your child into a cool 3-wheeled trike. Kids can start out by relying on the parent to push and steer it because when the parental handle is in place, the trike steering is locked. Once the child grows to stage 2, you can remove the foot rests but still guide them as they learn to pedal. As they gain independence and confidence they will love the trike because it will be so familar to them. Once they can pedal, you just remove the parent handle and the kids can then bothe steer and pedal on their own. 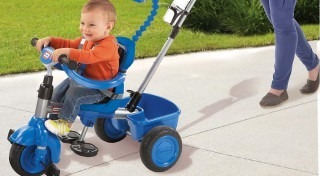 Little Tikes have been making the 3-in-1 Trike for several years and it has been proven to be a popular product. It's largely weatherproof and is good for kids from 18 months to 3 years old. That's a good value buy. Something that will last for 1.5 years of constant use needs to be durable and in typical Little Tikes fashion, this trike will go on and on. It's that crazy little truck with the bug eyes again! 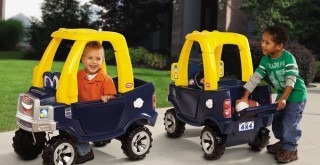 The Little Tikes Cozy Truck wins a 5 star rating for durability and sheer playability. Our son love this little monster truck with it's big wheels and horn. This review confirms that it's one of the best ride-on's around because it will go the distance and provide great value over time. Kids have been riding these Little Tikes trucks for over 20 years so you have probably seen one before. I guess the nice part is that Little Tikes now make the Princess version which comes in a prettier color than the regular black. Very strong and sturdy these mini trucks will last for years and provide hundreds of hours of fun. Best for ages up to around 5 years old, depending on the child's height. This truck has the potential to become your kids favorite toy of all time. We found that it's not so easy to build from new. It's a bit complicated to construct so worth allowing extra time to out the thing together, even if you are experienced at that sort of thing. The Little Tikes Cozy Coupe is a true American classic kids ride-on car that has been around for 30 years. It has stood the test of time as one of the best on the market. I fact, the Cozy Coupe is probably the best-known of the entire Little Tikes range. As it has been popular for so many years both parents and children are familair with this favorite. In the full review we look at the detail and reasons why it has been a top ride-on car for the last 30 years. 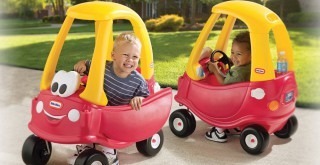 Is the Little Tikes Cozy Coupe right for your child? I'm confident enough to say that it most-likely is right for them! The new edition has some features which were introduced in the special 30th anniversary edition like a parental grab-handle and cup-holders. We have never been more spoiled for choice when comparing Ride On Toys. There are quite a few scenarios to consider when choosing the best one, like where will this ride-on be used? Is my environment suitable for the vehicle? Do I have the room to store it? The list goes on and on. Although most Ride On Toys can be taken outdoors it is probably best to stick to smooth gravel free surfaces as sometimes little pieces of gravel get stuck in the wheels and you have a scratched floor the next time your little one skids into the living room! The best of the Ride On Toys we had for my son when he was just 2 years old was The Wheely Bug which comes with castor wheels that go in any direction. The Wheely Bug was also great for when he was just starting walk he was climbing all over it pushing himself all over the living room. Another good one featured in our reviews (for some strange reason I like the design) is the Pewi YBike Ride-on Toy and Walking Buddy it looks like a friendly dog! Then there is the other side of ride ons, the wonderfully creative ride on suitcase the Melissa & Doug Trunki (Amazon discounts link) they come in so many cool colors and designs and are a must for kids in airports. Apart from the classic Little Tikes Cozy Coupe Ride On which you cant go wrong with, there are quite a few cool ride-ons to also consider when comparing. The Step 2 Easy Turn Coupe is based on the Little Tikes Cozy Coupe but with a few innovations (I think) it has a single front castor wheel and two wheels at the side and they seem to act as stabilisers. Anyway click the Amazon discount link and take a look. Radio Flyer do a fantastic range of outdoor ride ons everything from retro Radio Flyer Classic Wagon to the very smart Scoot about. We will post full reviews of all of these top kids ride-on toys over time so please do check back regularly. All kids love these ride-on toys!